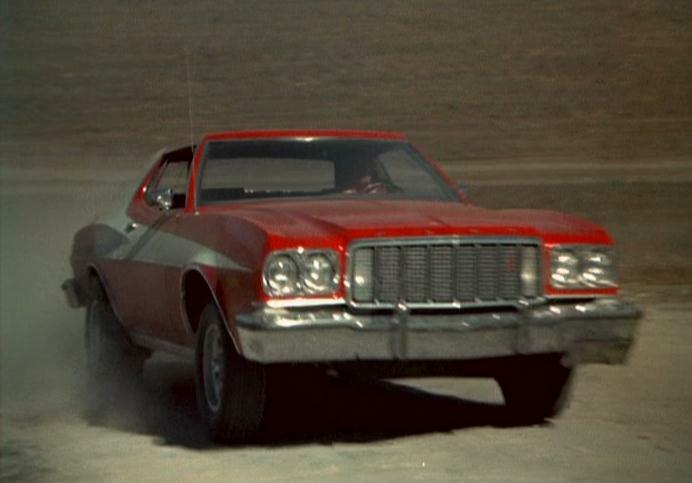 IMCDb.org: 1976 Ford Gran Torino in "Starsky and Hutch, 1975-1979"
Several cars were used. 1974 or 1976 models. 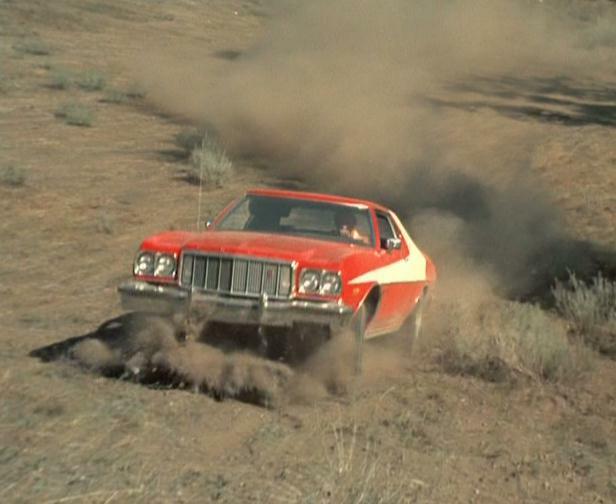 Hey, I saw this car in the first episode of The Dukes of Hazzard once. Why is their car in that show? Also, there's a liquor store in my town with one of these cars there. Pic 1: "Zebra 3, Zebra 3, this is Captain Dobey speaking.."
Pic 3: How did that happen ? It was in the pilot episode. A young couple were mistakingly murdered because they had exactly same looking car. Wasn't there another Torino used in an episode? interior shot of the "striped tomato"
Like a lot of shows back then, the Torino was changed every model year of that body style. 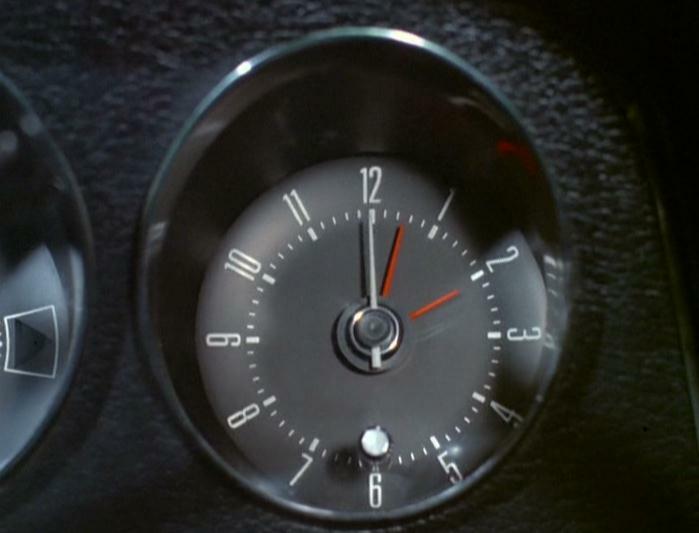 I suppose they kept the same vehicle when the body style changed in 1976 until the end of the show's run. I do remember that the first season the interior of the Torino was the base model (bench seat). Next season the car got the fancy interior (bucket seats). DOes anyone else remember this? I owned a 74 with bench seat. That bench was terrible. 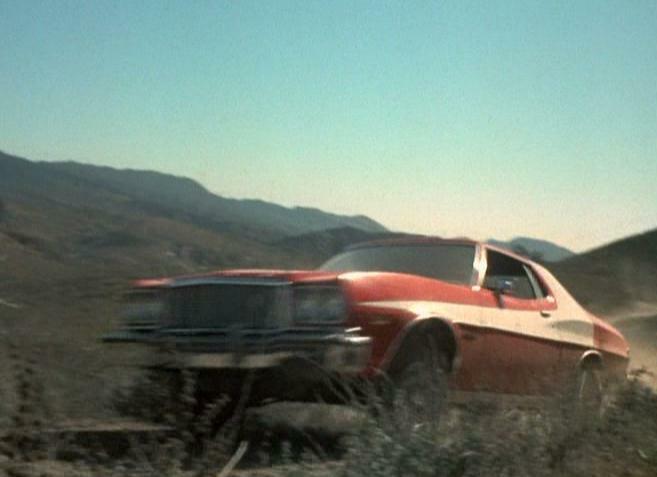 customtrucker wrote Wasn't there another Torino used in an episode? 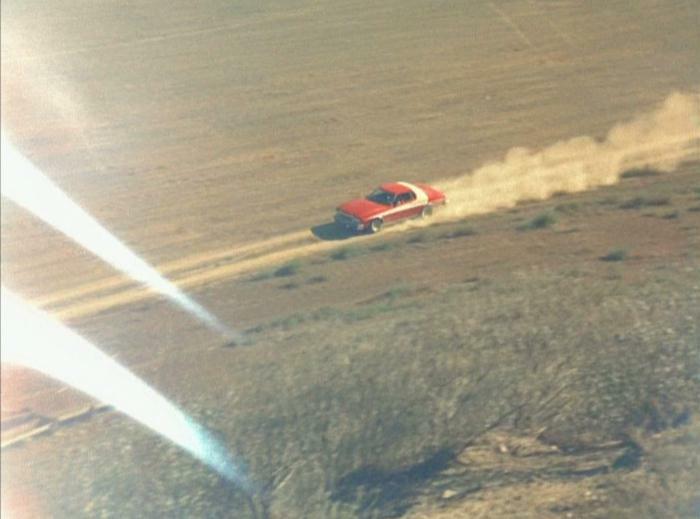 Raul1983 wrote Pic 1: "Zebra 3, Zebra 3, this is Captain Dobey speaking.."
picture is from episode 3. 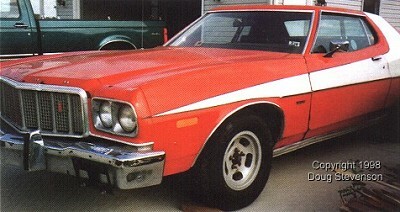 The red/white Torino used in the pilot was actually a 1975 model from the studios car loan program, has chrome mirrors, and chrome bodyside moldings. 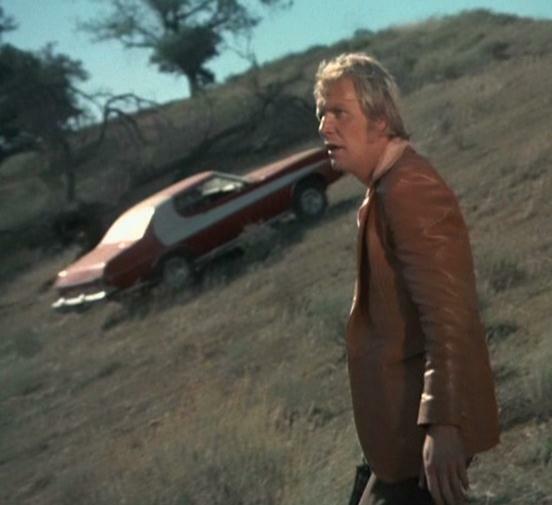 The torino is basic model which was a originally silver with matching bumper panels, whitewall tires, and was painted over to bright red with a white stripe with blackwall tires aftermarket slotted mags, and air shocks added. 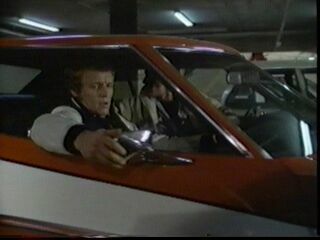 The Murder victims actually use the same car as Starsky. The two pilot Torinos in today's world which are currently owned by Douglas Stevenson in Cleveland, Ohio. 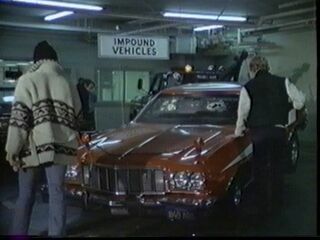 Quote The Ford Torino story reminded me of a car my cousin had about 20 years ago, It was one of the red and white "Starsky and Hutch" Torinos. After he owned the car for awhile, he found the factory build sheet and did a little resarch. 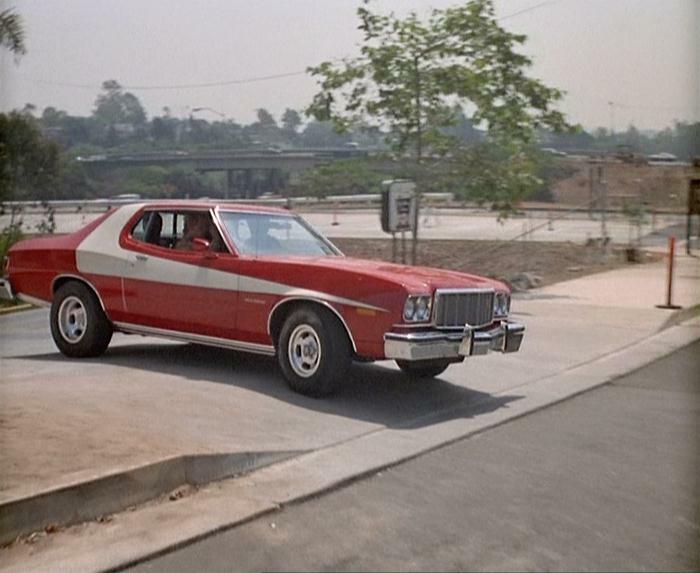 Turned out that his was on of a dozen or so "real" Torino Grand Sports built by Ford and sold to Aaron Spelling Productions in California for use in the Starsky and Hutch TV show. Whether his car was actually filmed for any of the episodes is unknown. He eventually had to sell the car, as it didn't exactly blend in with traffic and was always being watched by the local police department. He sold it to a new owner, who unfortunately totaled it a short time later. 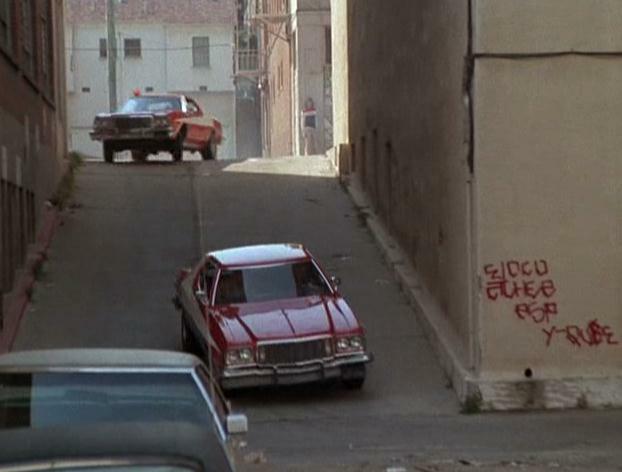 Delta Fox wrote Hey, I saw this car in the first episode of The Dukes of Hazzard once. Why is their car in that show? Also, there's a liquor store in my town with one of these cars there. 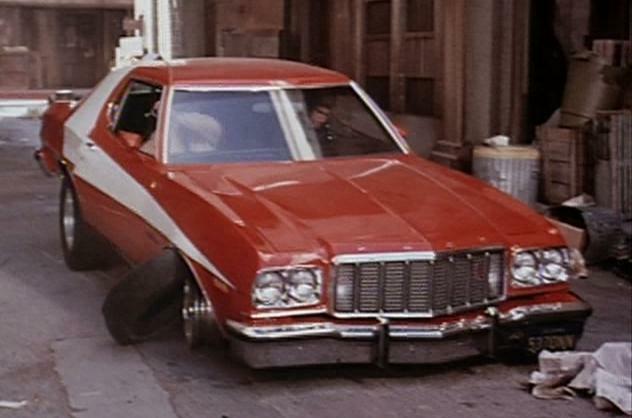 The producers of Dukes of hazzard also made starky and hutch, when Starksy and Hutch came to an end the producers used ''the red tomato with the white stipes as cooters' car. Been watching this on cozi tv ...I wonder how many door hinges they went thru ! Everytime they stop they let those doors fly open...OUCH! 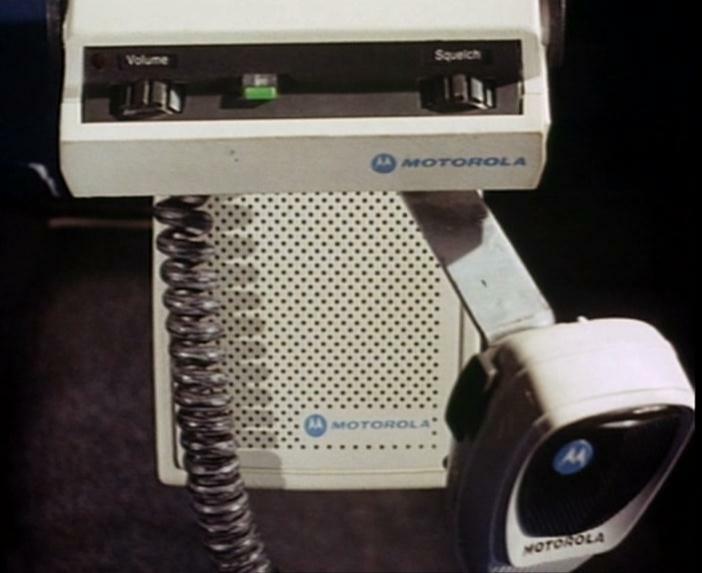 Two brand new 1975 models were used for the 1974 pilot. They can be told apart in the pilot; one has chrome mirrors and the other has body-colored sport mirrors. Both had vinyl bench seats and 351 Cleveland engines, and the base color was Ford "2B" bright red. 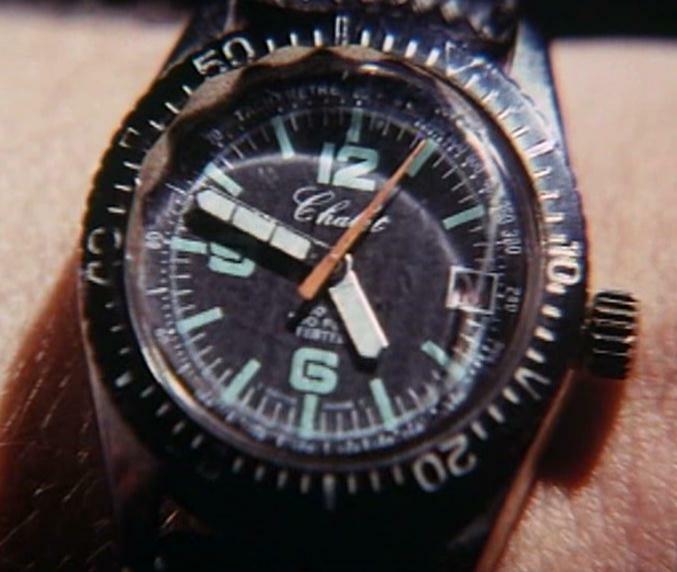 Two different 1975s were ordered for season one. They differed from the pilot cars in that they used black rubber bumper strips, they didn't have body side moldings, the stripe design on the side was revised somewhat (a sharper taper towards the front and not as flat on the bottom), and the cars used cloth bench seats. Both had body-colored mirrors, and both used 400M V8 engines. For the start of season 2, two new 1976 Torinos were used. These cars had chrome mirrors and body side moldings, 460 Lima V8 engines, and also finally had (vinyl) bucket seats. 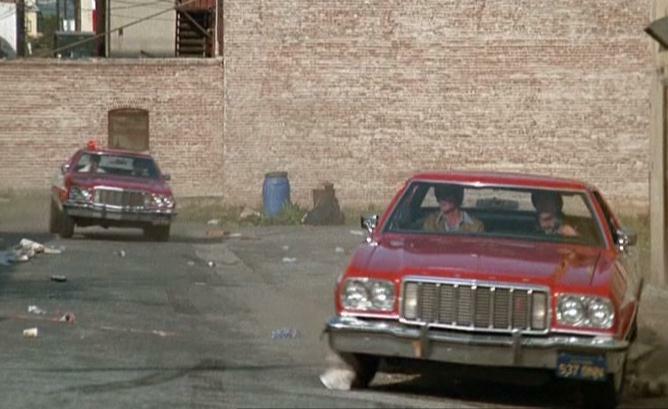 These cars were ordered as part of the Ford fleet program (the only way the "2B" red base color could still be had on 1976 Gran Torinos), and like all fleet-ordered models, they had silver-painted bumper filler panels. These cars were kept by the production company until the show ended in 1979, and by the final season, were really starting to show their age. 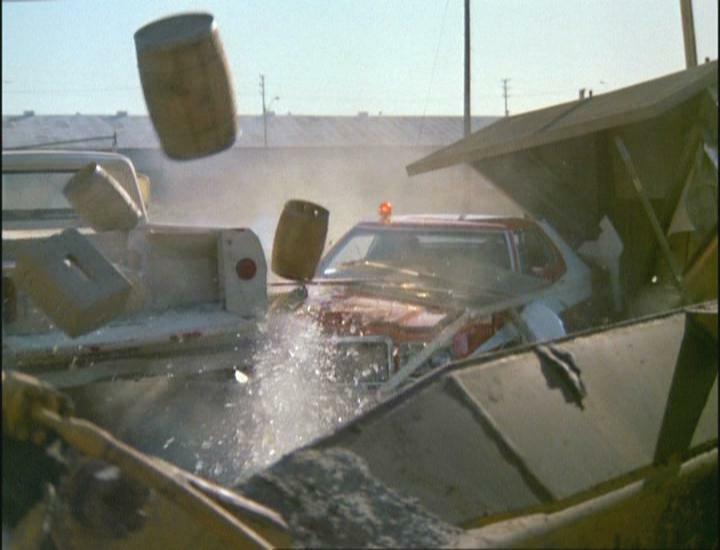 And of course, various other Gran Torinos were used along the way for heavier stunt work and crash scenes. These were probably mostly 1974 models, at least early on. 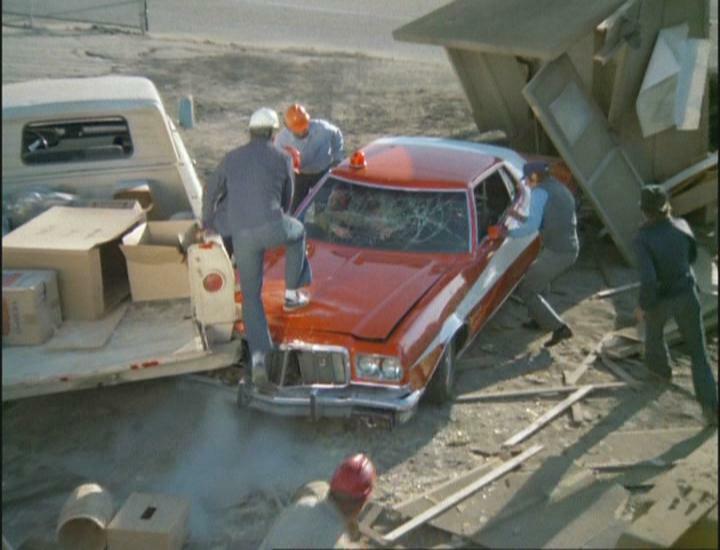 One was the episode 3.20 car shown wrecked above. Surprisingly, despite being a throwaway crash car nearly 40 years ago, this car still exists today in fully restored form.